Robert Henry Crane was born on the 20th of June to parents John and Linda and resides in Strahan, Tasmania. He had six children, Joanne, John, Patty, Linda, Michael and Kelly. Robert worked as a sawmiller in Strahan and in the West Coast of Tasmania. 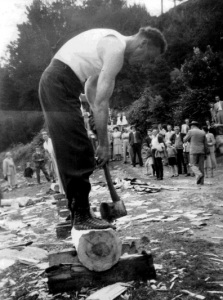 His favourite pastimes include playing 8 ball and woodchopping, his favourite event being the foot standing block. Robert or ‘Cowboy’ has won many events and has travelled Australia competing however never kept any records. 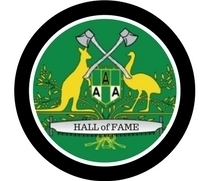 He received an Australian Axemen’s Association Award of Merit, competed in the Masters Games in 1991 at the age of 79 and was still competing in his 80s. Robert is known as a great story teller, was notorious for leaving his gear behind at the events and is also the last surviving Huon Piner. He started chopping around 18 years of age and chopped into his early 80s. Now 90 years old and no doubt would still have a go at chopping a block.